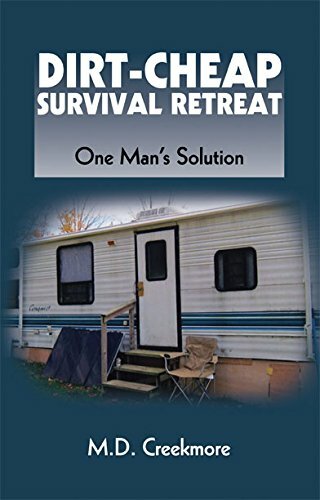 The standard survival retreat advice has always been to find a remote place in Idaho or Montana, with at least 20 acres, a 2,000-square-foot log cabin and a bunker underneath, a barn, pastureland, and a stream running through the property. But how many of us can afford such a spread without a crippling mortgage? If you can't make the hefty payments on your survival retreat, the bankers will evict you, leaving you worse off than those who failed to prepare in the first place. M.D. Creekmore's motivation for finding a low-cost retreat was the need to live on a lot less money after he lost his job and got divorced. He started living in a travel trailer, parked on two acres he'd bought a few years back to use as a campsite and bug-out location, never dreaming he'd be living there full time. But he has called his trailer home for the past four years and says that "for the first time in my life, I'm actually content." Living off the grid in a travel trailer isn't for everyone. But if you are looking for a way to own a debt-free home—and enjoy the security that comes with it—here's the author's dirt-cheap plan for finding suitable land; buying a used trailer; securing it against the elements and intruders; providing alternative power sources; dealing with water and waste issues; maximizing your space; and establishing a workable storage system for food, water, medicine, tools, and other equipment. The good news is that the author has done the hard part for you. M.D. Creekmore is one of America's foremost experts on survival, emergency preparedness, and self-reliance. He has dedicated his life to learning the skills needed to stay alive in an increasingly dangerous world. Since its inception in 2007, his blog ( www.thesurvivalistblog.net ) has grown into one of the most popular preparedness sites on the Web. A few years ago, he got sick of being another rat in the rat race, so he bought two acres of land off the grid for $2,000 and parked a 26-foot travel trailer on it--this is now his full-time home and survival retreat. He is a black belt in Shotokan karate, gunsmith, survivalist, homesteader, and all-around nice guy.